Unfortunately, we were not able to bring the sunny Gold Coast beach weather with us to Sydney. We were wet for most of the week we spent there, but the rain didn’t stop us from exploring! Our friend Spencer met us in Sydney for the week and we had an awesome time catching up with him! You can read his blog here. (This blog may not be appropriate for young children or people who care about what pops up on their work computer screen. You've been warned.) On our first full day in the city, we went on a free walking tour. It was a great introduction to the city and gave us some ideas about what we wanted to do during the week. Sydney began as a penal colony (same story as Brisbane- the British sure did have a lot of criminals back in the day…), and many of the historic buildings downtown have been preserved. The oldest historic district in Sydney is called ‘The Rocks,’ where settlers first started to live. It’s a really quaint district, with many small paths and streets filled with cute shops and restaurants. They also have a free museum called The Rocks Discovery Museum that is worth checking out. 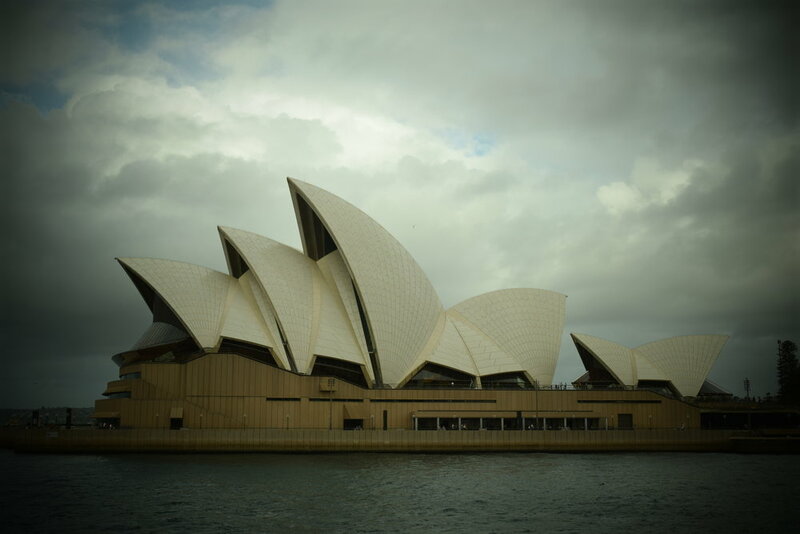 We decided to do a tour of the Opera House early in the week since it was an indoor activity and it kept raining! I was skeptical at first about paying $25 to take a tour of the Opera House- but it was worth it. They explain about the history of the building and take you into most of the performance halls. There are 5 performing spaces in total, and the largest concert hall can hold 2,700 people! The next day we went to the zoo. Spencer could barely contain his excitement at the prospect of hugging a koala. While we didn’t get to pet one, we did have a private session with a zookeeper and a koala named ‘Darwin.’ It was his 10th birthday! He seemed pretty content to let us take our photos while he ate. The Taronga Zoo is well worth your time if you end up in Sydney. Since the weather forecast was so poor, we didn’t have to fight any crowds and were able to see many Australian animals and a few of the shows that they put on at the zoo. One of the best parts is that you have to take a ferry over to the zoo, and then they get to the entrance via cable car- so you get great views of Sydney Harbor! We randomly explored a few other areas of the city including Luna Park, Olympic Park, the Harbor Bridge, Darling Harbour and the Queen Victoria Building. On Thursday night, my parents arrived safely after their 3-day pit stop in Hawaii (rough life, we know). The next day all 5 of us took the bus out to Bondi Beach. The wind was pretty intense and it was raining off and on, so we didn’t get in the water, but we did brave the coastal walk. We only made it to Bronte Beach before we got sick of the saltwater pelting us in the face. We hopped on another bus back into town and explored Paddy’s Market and then went to the Fish Market for lunch. The seafood was great!!! Sydney seemed extremely expensive to us. We ate out for most of our meals here, and the nicer meals didn’t come cheap- but everything was delicious! We had to try some local delicacies. One night we ordered 2 pizzas, one topped with kangaroo, and the other topped with crocodile. Sydney Harbor was a dream to photograph - and looks even better in person!